Denise Breitburg, a marine ecologist at the Smithsonian Environmental Research Center, and her colleagues have thought up many novel ways to investigate the impacts of dead zones and acidification on Chesapeake Bay fish and invertebrates. Among their ideas: attaching tiny transmitters to fish and monitoring their movement in relation to oxygen and pH levels. Now, a new $1.4 million grant from the National Oceanic and Atmospheric Administration will enable them to pursue this experiment and a host of others. Image right: SERC senior scientist Denise Breitburg will lead the NOAA-funded study of hypoxia and acidification in the Chesapeake Bay. Researchers have long known that most fish cannot survive the dead zones that plague the main stem of the Chesapeake Bay. 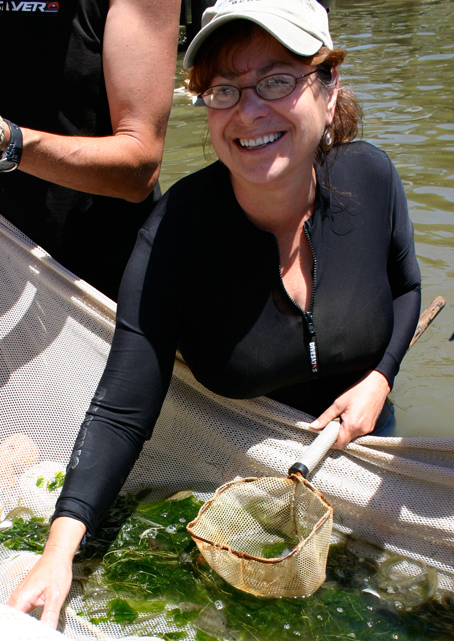 Much less is known about how fluctuations in oxygen levels that occur daily in waters along the Bay’s shoreline affect fish and invertebrates. It is a phenomenon called “diel-cycling hypoxia.” This is where Breitburg and her colleagues from the University of Delaware, Louisiana State University, the NOAA Chesapeake Bay Office and the Maryland Department of Natural Resources will focus their research. To some extent diel-cycling hypoxia occurs naturally, but nutrients from agriculture, sewage and other human activities exacerbate the problem. Diel-cycling hypoxia happens in shallow waters that are rich with underwater vegetation and phytoplankton. During the daytime, when the plants are photosynthesizing, these areas can become oversaturated with oxygen. However, after the sun sets and organisms continue to respire, oxygen levels plummet and the water becomes hypoxic. Furthermore, respiration adds more CO2 to the water, making it more acidic. Image left: Researchers recreate diel-cycling hypoxia in aquaria containing eastern oysters. Breitburg’s team is measuring how the nighttime dips in dissolved oxygen impact disease rates in the mollusk. These changes in water chemistry can be stressful for aquatic creatures. Breitburg and her team want to determine just how much stress they cause. 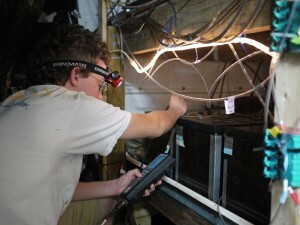 Over the next five years they will conduct a series of lab and field experiments that examine how diel-cycling hypoxia and the associated acidification affects the growth and disease rates in striped bass, the eastern oyster and other ecologically and economically important Chesapeake Bay species. They will also study the animals’ behavioral responses to these changes: do they avoid these areas or have they developed techniques to cope with them? 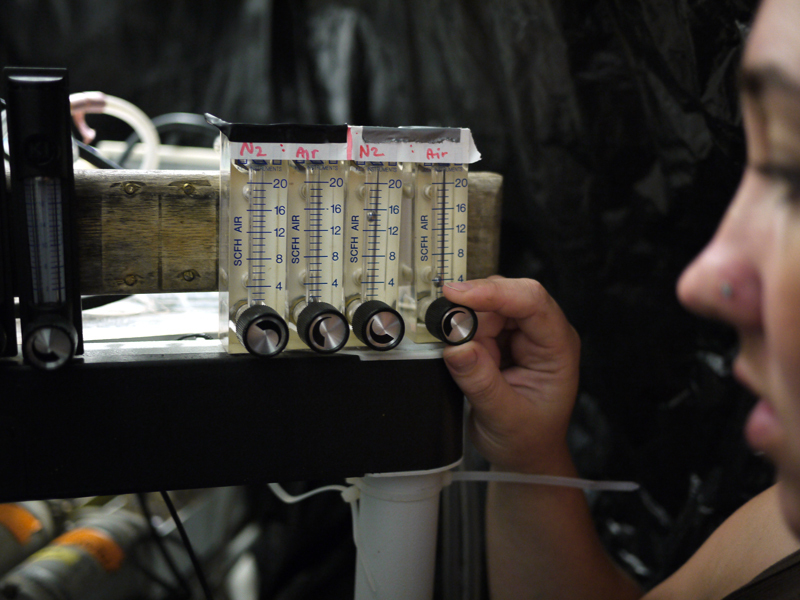 Image right: By adjusting the proportion of air and nitrogen that is pumped into the aquaria, Breitburg’s head technician Becca Burrell controls the dissolved oxygen levels that the oysters experience. After examining the impact of these conditions on individual species, the researchers will develop a baywide assessment of the problem. They will use mathematical models to translate experiment results and field measurements into predictions of the effects on specific animal populations and the Bay food web as a whole. A key question is whether or not the nighttime low oxygen and increased acidification levels act as a tipping point for the Bay’s fisheries. Because the deeper water dead zones have made vast stretches of the Chesapeake uninhabitable, these near shore regions may have become more important to fish and shellfish. Modeling the impact of diel-cycling hypoxia and acidification on the Bay’s food web will give resource managers a more accurate understanding of the factors driving population dynamics in the fisheries. Breitburg’s group will begin their lab experiments this fall and fieldwork next summer. The research continues through 2015.